After a while, purchases in the Blythe hobby just don’t seem that expensive. It’s a really weird phenomenon that you might have noticed in your own dolly spending. First it comes with a $10 dress, then the dresses become $30 or $40 (this gets exponentially worse when you’re not actually in a country that uses USD because of the horrifying exchange rate – Canadian dollar, I am glaring at you…). When I was first venturing into the Blythe hobby, the Hasbro LPS Petites did not exist and the only Petites that did exist were of the Takara variety. These were both awesome in the fact they were (primarily) miniature versions of Blythes that already existed or created to be companion releases, and also seemed exceedingly expensive for what they were. At the time that I joined the Blythe hobby and started collecting in 2009, Takara Petites were probably around $20-40 USD, which isn’t to far off from how much some of them cost today. It just seemed like a lot because shipping alone was often roughly half the cost of the doll. And despite the fact that shipping for a full-sized Neo remains today anywhere from $30-50 CAD, it doesn’t seem nearly as bad as paying 50% of the cost of a doll on shipping. The fact remains that I didn’t get my first Petite until 2011 as a gift from a dear friend, and then later purchased my second LPS Petite from a local chain store when they were still being sold in stores. Left to right: Pipsqueak, Shrimp, and Lark. See the funny thing is that despite LPS Petites being inexpensive, I never really bought many of them (I bought one for myself, and another for a Secret Santa gift exchange with the local Blythe group). I think this is in part because there was no thrill involved. There’s some internalized hype when you buy a doll and eagerly check and recheck the tracking to see the progress of her arrival over the Pacific Ocean. There’s the thrill of sniping an eBay auction or being the first to contact someone on a forum or Facebook on the perfect Blythe doll for your family. Being able to go out and buy a Blythe wasn’t as exciting for me – plus at the time LPS and Takara Petites didn’t really stand out in my doll family (and at a lowly number of 3 with absolutely no wardrobe, they still don’t really stand out – mostly because I’m currently not willing to sew clothes that are that small). 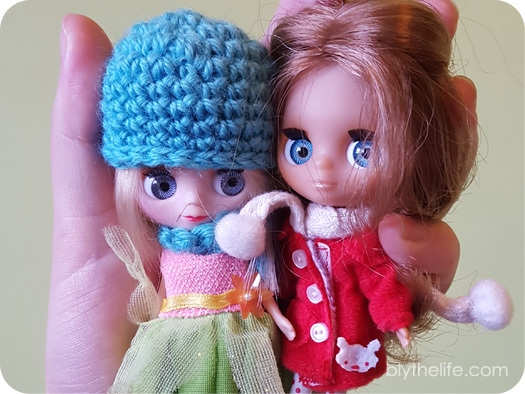 My first two Petites were both of the LPS variety, and they don’t often get taken out as often as I would like despite the fact that they are very pocket friendly and quite easy to pose as they aren’t as top-heavy as their full-sized sisters and have a lower centre of gravity. I still don’t do very much with my Petites, but I do love them. After all, they make for a fantastic and cute handful. I think if I were to add a Petite into the doll family at this point, I would probably look for a Takara Petite because I do like their ‘sleep’ eyes. Plus there is a nursing themed one (Intensive Care) that I actually think would be great to have (even if she’s not a nurse for people like me). 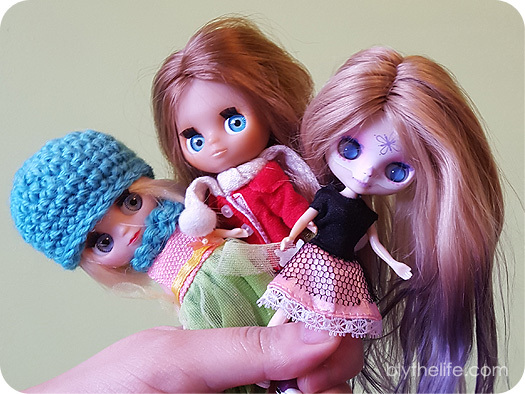 Do you have any Petites in your doll family? How do you have? I have 8 LPS and 2 Takara! I have just one petite, and she’s an LPS. I agree – I looked at LPS petites in the store quite often but didn’t really feel a pull to own more of them. Part of it is definitely that I don’t have much wardrobe for them (I designed one sweater for petites but haven’t knit more than one for myself for some reason). I think part of it is also that they are such stripped down versions of the things I love about Blythe – no switch-able eyes primarily, but also I think that they don’t look unusual enough. Part of what I love about Blythe is her unique look that is like no other doll!